Goats are herd animals and usually don't like to be alone so it's best to get more than one. 1. First, Check Local Laws. Before getting a goat, make sure they are allowed where you live. Check your town’s regulations to ensure goats can be kept within your city’s limits and whether there are any restrictions regarding goat size or weight. Also, be aware many cities regulate how close animals can be housed to dwellings or neighboring properties. Goats also can be very loud so before you adopt or purchase one, make sure your neighbors will be tolerant. 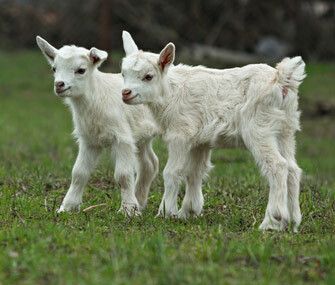 There are two sizes of goats, miniature and standard-size breeds. Standard-size breeds, such as the Nubian or Alpine, weigh between 100 and 200 lbs. or more. Mini-goats, such as the pygmy and Nigerian dwarf, tend to be more popular in urban areas because of the many local restrictions on goat size and weight (these smaller breeds tend to weigh 100 lbs. or less). If your backyard barnyard is miniature as well, make sure that the tiny “kid” goat or goats you bring home won’t grow up to be bigger than you are expecting (baby goats are called kids, female goats are called does, uncastrated males are called bucks and castrated males are called wethers). Goats are active and playful. A miniature goat requires a minimum of approximately 135 square feet of romper room space; a standard goat needs twice that, with the square footage multiplied by the number of goats you have. Goats, whether big or small, need a yard that provides part sun and part shade and is protected from strong winds. Goats also need an attached and draft-free shed or barn for cover, sleeping and protection from predators and extreme temperatures. Any windows in their enclosure should be higher than the head of the tallest goat when she is standing on her hind feet. If not, the windows should be covered with bars or screens so that a goat can’t poke her head through. Indoors, a doe and her kids need a 4’ x 9’ stall for comfort. You’ll also need somewhere to safely store their food and somewhere to dispose of their soiled bedding. 4. Good Fencing is Key. Goats like to rub on fences, especially when shedding, or try to stick their heads through any openings to eat some delectable item just out of reach. Goats are also clever about getting out of their enclosures. All of this means that goats are hard on fencing. It needs to be reinforced with strong wood posts sunk deep into the ground and needs to be escape-proof with slats close enough to prevent their heads from slipping through. It also needs to be high enough to keep them in (4’ high for mini-goats; 5’ high for standard). If you use wire, make sure it is sturdy enough that a goat can’t bend it or push it down to escape. Goats also love to chew wood, so if you have wooden fences, be prepared to replace them every few years.